What do Arnold Schwarzenegger, Eleanor Roosevelt and Lise Veronneau all have in common? No, it’s not their tenacious ability to take charge and get things done. 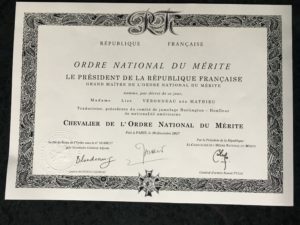 It’s that all three are foreign nationals who have been granted admission to France’s Ordre national de la Légion du Mérite. Veronneau rang in the New Year celebrating her admission to the Légion in the rank of Chevalier, or the English equivalent of knight. “I was totally surprised,” she said. “I had no idea that this was in the works nor how it came about.” She was nominated by Valéry Freland, Consul général de France à Boston, who had submitted her name along with a description of the work she has been doing to create close ties between Vermont and France to the office of French President, Emmanuel Macron. She said that the most significant thing about being knighted is that the French government knows about and values the work that she has been doing. “[France and the U.S.] share interests and common goals that we can all help each other achieve,” she said. It does not come as a surprise that Veronneau was granted membership to the Légion as Chevalier. 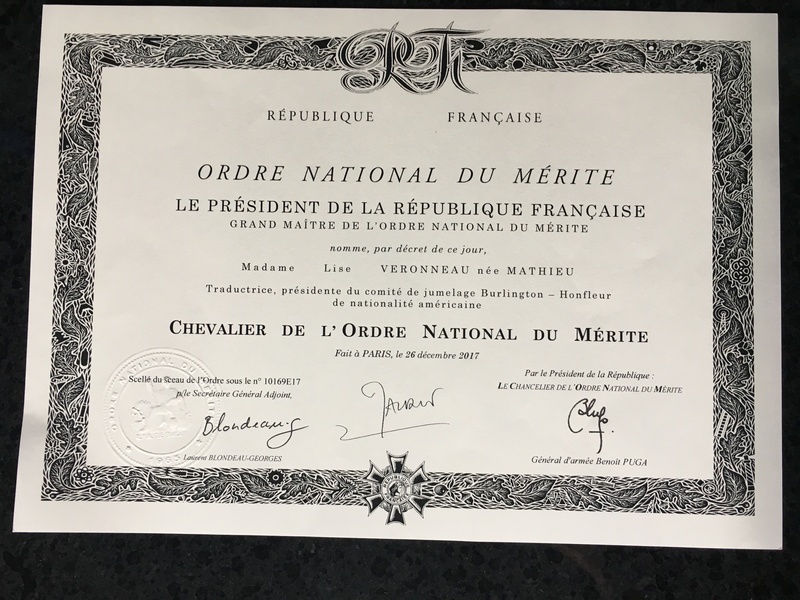 The title itself implies that, in accordance with the Légion’s criteria, she has served for a minimum of 20 years in public service while exemplifying French values. Chevalier is just the first in a series of five classes of increasing distinction within the Légion, a merit-based order system established by Napoleon Bonaparte in 1802. At the time, he wanted to abolish the nobility-based ranking system of the overthrown monarchy in France, which he replaced with the current system that is based on civil and military merits. As Chair of the Honfleur Sister City Committee, Veronneau has worked to foster the relationship between Burlington and Honfleur, France for several years now. Citizens from both Burlington and Honfleur, the port city from which Samuel de Champlain set off to the Americas over 400 years ago, have come together to exchange language and culture thanks to her work. Some of her more notable collaborative efforts with Honfleur have produced exchanges between Scout troops, artists and high school students from both cities. In 2017, a delegation of Honfleur citizens came to Burlington to explore their sister city and see what life is like in Nouvelle France. Upon their return to Honfleur, they established a new residential housing project and plaza bearing the name Square Burlington. Without Veronneau’s dedication to promoting French language and culture, Burlington would not know this fruitful partnership with Honfleur, nor would it have experienced the several Francophone flag raisings, projects, exchanges and other events she has spearheaded. “It is important to remember that whether we speak French or not, we can celebrate French culture and create opportunities for collaboration while developing life changing relationships,” she said. Some of the initiatives Veronneau is currently working on include the upcoming French for Business Class in January and February, a Francophone flag raising event in April, and a trip to Honfleur in September celebrating the Honfleur-Burlington Sister City partnership. Going forward, Veronneau said that she hopes people will be inspired by her story to go out and serve their communities. “I encourage all to go out and get involved in their community and help where they can to brainstorm and come up with creative solutions to challenges,” she said. Veronneau also noted that she would like to see more growth within the local Francophone community on all levels, by broadening economic ties with French communities across the Atlantic, promote Vermont as an attractive Francophone destination, celebrate cultural diversity in the area, and above all, make speakers of French feel welcome. “Maybe my Chevalier status will give Vermont another platform for launching future projects,” she said. You can read more about Veronneau’s life and accomplishments here. 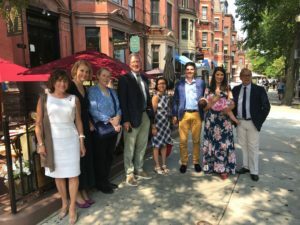 I would like to thank all the people who have helped see initiatives and projects to fruition, all the French organizations like Alliance Francaise I’ve worked with, especially the dedicated members of the Honfleur Sister City Committee and Honorary Consul to France for Vermont, Mr. Ernie Pomerleau.